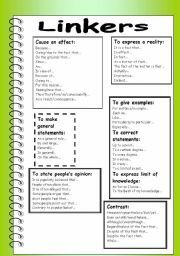 An useful guide to write for and against essays. I hope you like it! 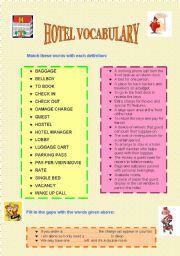 This is a ws to practice hotel vocabulary. First students have to match some words with its definition an then fill in the gaps with these words. Finally, they have to make a conversation introducing the words they have learnt.I hope you like it! 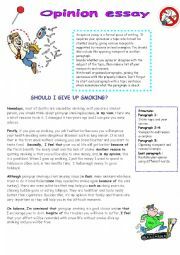 Here is the giving up smoking essay I told you I was preparing yesterday. It includes the structure and a model. 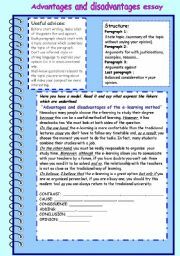 It�s the same topic but with an opinion essay�s structure. I hope you like it! Some useful linkers and phrases to write great compositions. I hope you like it! 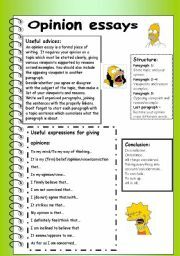 An useful guide to write greeat opinion essays. I hope you like it! A ws to practice with linkers and to write great compositions. 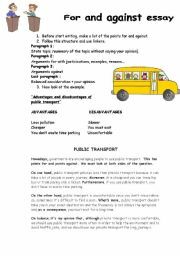 I use this ws to show my students how to write great essays;this is a model of advantages and disadvantages of public transport. Fisrt make a list with your ideas and then, start to write. Linkers are in bold to make it easier. I hope you like it! 8 pages to rephrase sentences. 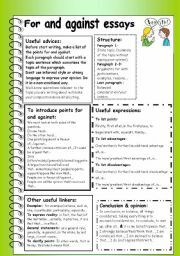 It includes main grammar structures: reported speech, modal verbs, passive, relative clauses, conditionals, comparatives, verb tenses, so-such, too-enough, linkers,infinitive or gerund.... 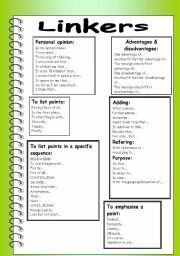 I use it with my 2�bachiller pupils at the end of the course to prepare PAU exam. I hope you like it! 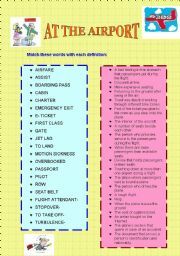 This is a ws to practice travelling by plane vocabulary. First students have to match some words with its definition an then fill in the gaps with these words. Finally, they have to make a conversation introducing the words they have learnt.I hope you like it!